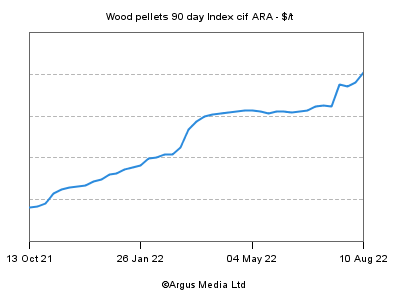 It’s been a year filled with development and market growth, as speakers emphasized at the 2018 Wood Pellet Association of Canada (WPAC) conference, but Canada has only scratched the surface of reaching Asian markets with Canadian wood pellets. WPAC president Rene Landry delivered the welcoming address at the Marriott Pinnacle Hotel in Downtown Vancouver on Tuesday. The first panel on global and Asian markets reflected this year’s theme of powering Asia with Canadian wood pellets. Global Affairs Canada's Pacific Region director Christian Hansen discussed Canada as a trading nation, while reporter Georgia Gratton from Argus Biomass Market shared data on global supply and demand dynamics. “Canada plans to more than double its production capacity in 2019,” Gratton says. And that applies coast to coast. Seth Walker from FutureMetrics discussed Asian pellet market development, with a special focus on Japan and South Korea. Most of the growth that FutureMetrics is predicting over the next years will be coming from Asia, Walker says. “Japan has embraced biomass energy in its future energy mix to reduce carbon emissions and provide balance to the grid,” Walker says adding that most of the growth is projected to come from wood pellets. FutureMetrics is predicting pellet demand from independent power producers (IPPs) to increase to 4.5 million tonnes in 2025 for Japan. FutureMetrics is also predicting a major increase in wood pellet demand for co-firing at major coal stations motivated by the feed-in tariff (FiT), generation efficiency standards and emissions intensity reduction. Several coal stations are already certified under the FiT, however co-firing demand in Japan is much more uncertain as a baseline of 3.8 million tonnes is needed to meet efficiency standards. FutureMetrics’ Japanese pellet outlook is that many projects are still years away, but there is a sense of urgency to secure contracts to keep FiT certifications, Walker says. Korean pellet demand has increased rapidly and Korea is now the third largest importer of pellets after the U.K., and Denmark. Walker says most pellet volume going into Korea is short term contracts or spot market volume. It's difficult for Korean utilities to make long-term agreements if their revenue is unpredictable compared to the more stable situation in Japan, Walker says. He says the Korean market uncertainty points to a market decrease in the future. The forecast is 6.4 million tonnes by 2024. Vietnam is currently dominating the Asian pellet market. It has met growing demand in Korea increasing to 1.6 million tonnes in 2017. FutureMetrics president and founder William Strauss set the stage in the day's second panel on sustainable fibre sourcing with a talk on Asian biomass fuel options including sourcing, sustainability, cost of production, and fuel characteristics. Strauss says coal is still king and it is not possible to eliminate it overnight. "What we need to do is think about a rational transition strategy from today to decarbonization," Strauss says. The strategy of using wood pellets as a substitute for coal is a rational way to transition from coal, Strauss says, adding that biomass is a resource that can last forever, if used properly. “The security of the pellet fuel supply is built into the business model,” Strauss says. Pacific BioEnergy's vice-president of operations Shawn Bells spoke about managing Pacific BioEnergy's fibre supply chain. Bells touched upon the first-of-its-kind ClassiCleaner from Dieffenbacher as part of Pacific BioEnergy's fibre cleaning system that was featured in Canadian Biomass magazine. Pinnacle Renewable Energy's head of sustainability Joseph Aquino was up next to discuss ensuring sustainable fibre sourcing in Western Canada, while Pinnacle’s senior vice-president of operations Scott Bax moderated the afternoon's panel on the wood pellet supply chain. Another member of the Pinnacle team, chief executive officer Robert McCurdy started off the panel discussion by talking about the company’s journey in becoming a leading pellet manufacturer and distributor in the world. He advised those in the crowd to run their companies from a safety-first discipline and credited Pinnacle’s success to that very mentality. CN's vice-president of industrial products Fiona Murray spoke about CN's role as a vital link in the wood pellet supply chain for Canada's Asian customers. And Fibreco Export chief executive officer Kerry Lige spoke about considerations in wood pellet handling through port facilities. Screen Shot 2018 09 20 at 5.08.45 PMRWE Supply and Trading's Henry Pease discussed how the biomass supply market is becoming global and what that means for Asian and European wood pellet buyers. B.C., pellets have historically gone to Europe and although most still go there, they will increasingly go to Asia, Pease says. More than two million tonnes of contracts into Asia have been announced since last year, Pease says, adding that this increase will establish B.C., as a hub. Pease says 2018 is already different to 2017: "It's a great time to be in the pellet business right now,” he says. “It's becoming much more interesting, much more dynamic." Despite an Asian market increase, Pease advises not to drop any European contacts as the pellet market is an interconnected network. He notes that wood pellets are becoming a globally traded product and Asia and Europe should work together to benefit from industrial demand for a similar product. The University of British Columbia’s (UBC) professor and director of the biomass and bioenergy research group Shahab Sokhansanj moderated the discussion on world class research and development in Tuesday’s final panel. Research associate at UBC Fahimeh Yazdan Panah presented about developing wood pellet combustible gas characteristics in support of ocean shipping regulations. And UBC postdoctoral research fellow Hamid Rezaei discussed the characterization of ground pellet particles for industrial pellet boilers and why coal should be phased out. Finally, UBC doctoral candidate Jun Sian Lee talked about analyzing the impact of rain intensity on wood pellet durability and its implications for ship loading during wet weather. Senior vice-president of Pinnacle Renewable Energy Vaughan Bassett wrapped up the day's sessions and highlighted some key takeaways from the Day One presentations. To emphasize the message of safety in the workplace, keynote speaker Brad Livingston dominated the room on Day Two with his empowering personal story of perseverance after a horrific workplace incident almost cost him his life nearly three decades ago. Livingston started his career in the pipeline department of a natural gas company in Elkhart, Kansas where he worked for six years until he accepted a job as a dispatcher in an attempt to start moving up the corporate ladder. As he explains, he grew tired of his office routine which he kept comparing to being out in the field as he was before. After four years, he transferred back to his pipeline job where he found joy in his work once again. On Sept. 20, 1991, just two months after being transferred, Livingston and his colleague Tracey were called to do welding work at a remote location in the Oklahoma Panhandle. As Livingston explains, the initial welding was completed and he and Tracey were taking a break when they were asked if they could “put it in their schedule sometime” to weld and fix leaks on two tanks. After that, Livingston says, there was red flag after red flag as Tracey didn’t have a good relationship with the supervisor on the remote site and decided to proceed with the welding that same day without notifying him. Next, he decided to bypass an important safety procedure to check fluid levels in the tanks, in order to save time. Livingston, then 32 years old, didn’t feel safe, but he didn’t argue. Tracey began welding on the first tank when another supervisor drove by, knowing it was unsafe to work on those tanks, but also didn’t put a stop to it to avoid a conflict with Tracey. The first tank was welded, Tracey moved to weld the second, and as Livingston explains the rest happened very quickly. He heard a sound from inside the second tank and knew it was going to explode. As soon as he yelled that out to Tracey, it did. The power of the explosion launched Livingston on top of the other tank. He was burning and felt “heat and pain like I never imagined in my life,” he says. While trying to get himself off that tank, it also exploded. Despite only breaking his left leg and having no head, neck, back or lung injuries, Livingston’s second-degree burns over 63 per cent of his body gave him a five per cent chance of survival. Tracey, a husband, father and grandfather, was dead at 48 years old. “The second explosion saved my life because I would have burned to death if I didn’t get off that second tank,” he says. After he was taken to the hospital, he said “Amen” and didn’t remember anything else for two and a half months. His family started getting notified and “the ripple effect started” and you have no control he says. At the hospital, his body swelled to the point of restricting blood flow. His heart stopped several times and doctors cut him open to get his blood flowing. His jeans had burned and melted right into his muscles. Doctors even told his wife Bobbie that they’d have to amputate both his hands and feet. “It’s not about how many stitches you take, but it’s about those people who count on you to get home every day and what they have to go through,” Livingston says. When he awoke nearly three months later, Livingston didn’t comprehend that the explosion happened months ago… He thought it had happened yesterday. Over the next months, doctors scrubbed his burned skin off down to the muscle and although he was unconscious on morphine he was told he was still trying to scream from the pain. Livingston would eventually undergo 18 surgeries in his healing process. “I can’t change what happened, but we can change from it and go forward… because you don’t need to go through it. Your employees don’t need to go through it, their families don’t need to go through it… It’s your choice, make the right decision, it’s up to you,” Livingston said to the silent room. His speech was followed by the conference’s final panel on growing Canada's pellet market moderated by the godfather of wood pellets John Swaan. Fink Machine's David Dubois was up first to talk about growing the biomass boiler market in Canada, followed by Martin Bentele from the German Wood Energy and Pellet Association to discuss the growth of the German pellet heating market and whether the same is possible for Canada. Harry "Dutch" Dresser, founding director of Maine Energy Systems, talked about tackling the challenge of bringing European biomass boiler technology to Canada and whether there is a path for Canadian adoption of EN 303-5 standards. And finally, Dan Coffey, sales and marketing manager at Shaw Resources, discussed evaluating WPAC's domestic marketing toolbox and shared new information on the latest wood pellet information site targeted at consumers. Next year’s WPAC conference and AGM will be held in Ottawa, Canada. See everyone there!